SCVHistory.com | Newhall School | Sale, Dismemberment & Private Development of Third Newhall School Site, 1925-1926. Sale, Dismemberment & Private Development of Third Newhall School Site. Notice of District School Meeting. 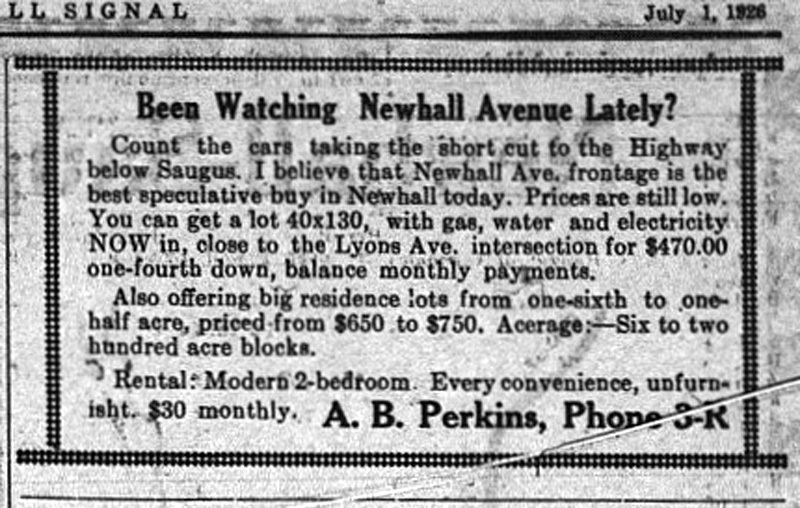 The Newhall Signal | Thursday, August 20, 1925. 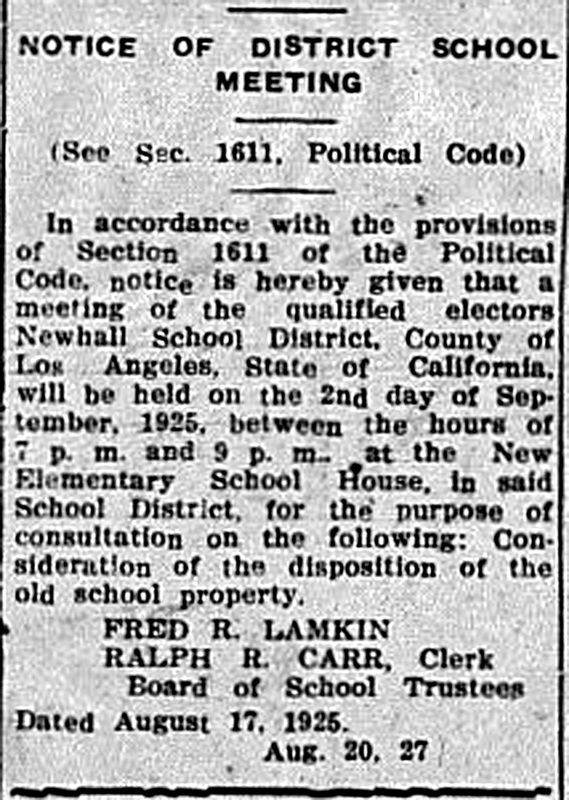 In accordance with the provisions of Section 1611 of the Political Code, notice is hereby given that a meeting of the qualified electors Newhall School District, County of Los Angeles, State of California, will be held on the 2nd day of September, 1925, between the hours of 7 p.m. and 9 p.m., at the New Elementary School House, in said School District, for the purpose of consultation on the following: Consideration of the disposition of the old school property. The Newhall Signal | Thursday, November 12, 1925. The old school property was sold recently by the school board under the notice published according to the school law, to A.B. Perkins, the consideration being $4,910. The Newhall Signal | Thursday, December 24, 1925. A.B. 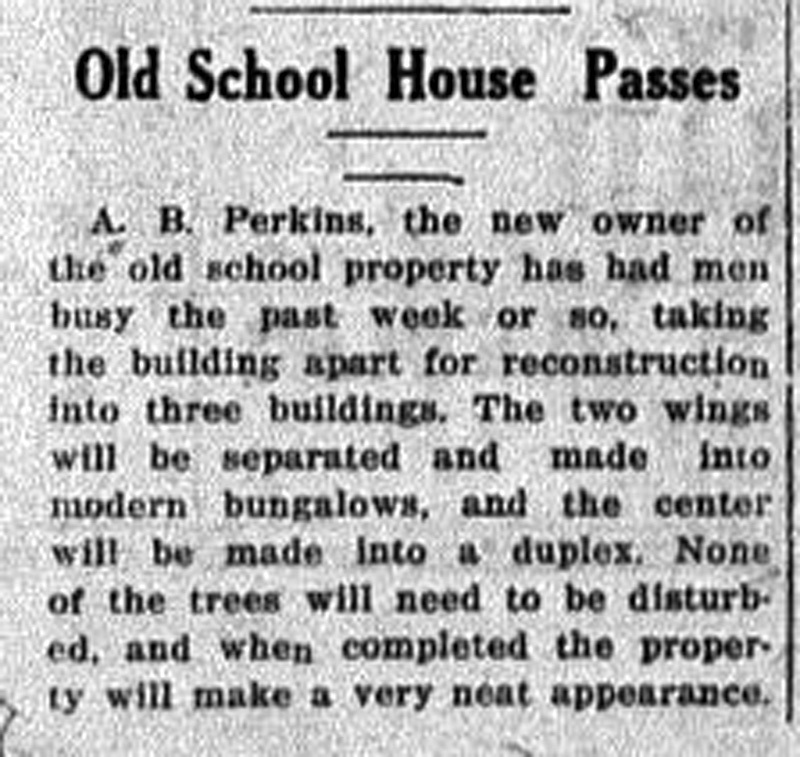 Perkins, the new owner of the old school property has had men busy the past week or so, taking the building apart for reconstruction into three buildings. The two wings will be separated and made into modern bungalows, and the center will be made into a duplex. None of the trees will need to be disturbed, and when completed the property will make a very neat appearance. The Newhall Signal | Thursday, January 18, 1926. Best Chance in the Last Eight Months! P.S. The last offering on Newhall Ave. was made last April. It sold out in two days. 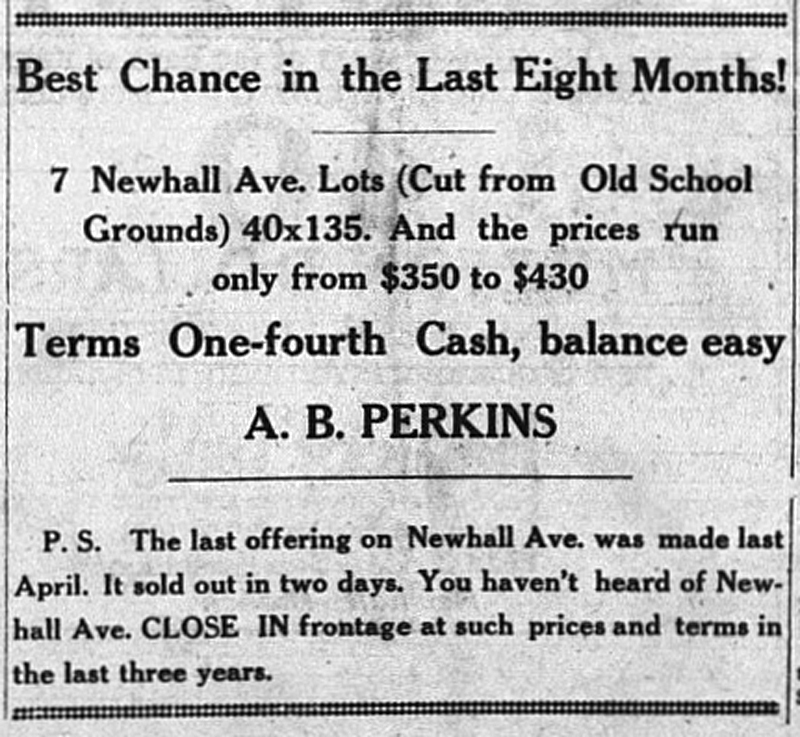 You haven't heard of Newhall Ave. CLOSE IN frontage at such prices and terms in the last three years. The Newhall Signal | Thursday, February 4, 1926. The old school house has been dismembered, and the three houses into which it is divided are rapidly being put into shape. They certainly make a fine improvement in the appearance of that part of town. The Newhall Signal | Thursday, February 18, 1926. Mr. and Mrs. Authur Williams of Los Angeles have purchased a lot which was part of the old school ground, and commenced the erection of a home. The Newhall Signal | Thursday, March 11, 1925. F.A. 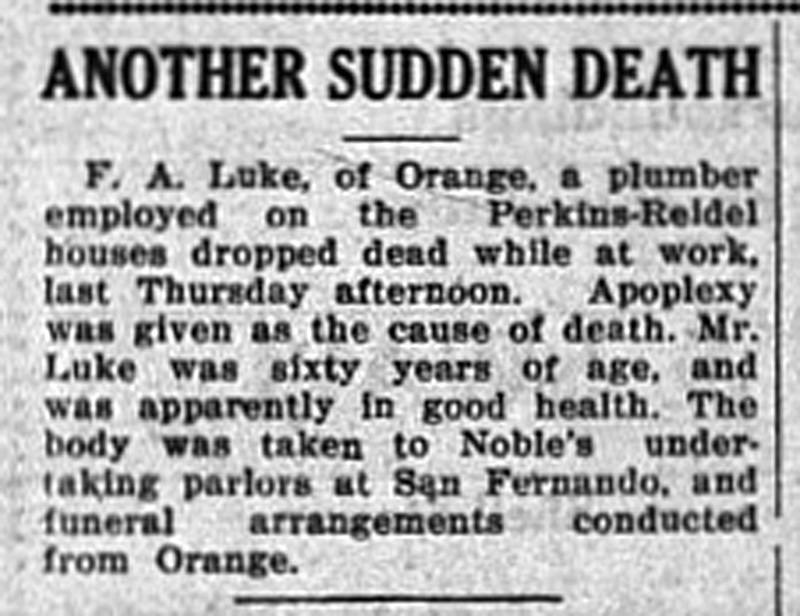 Luke, of Orange, a plumber employed on the Perkins-Reidel houses, dropped dead while at work, last Thursday afternoon. Apoplexy was given as the cause of death. Mr. Luke was sixty years of age, and was apparently in good health. The body was taken to Noble's undertaking parlors at San Fernando, and funeral arrangements conducted from Orange. The Newhall Signal | Thursday, May 13, 1926. Mr. and Mrs. R.R. Riedel moved, Monday, into the new house just completed on part of the old school grounds. The Newhall Signal | Thursday, July 1, 1926. A small tent house and the garage at the R.R. Reidel home were destroyed by fire Tuesday afternoon. The fire apparently originated in the tent house which was burning fiercely when the flames were noticed. Hard work on the part of helpers saved further spread of the flames, the direction of the wind keeping the house out of danger. 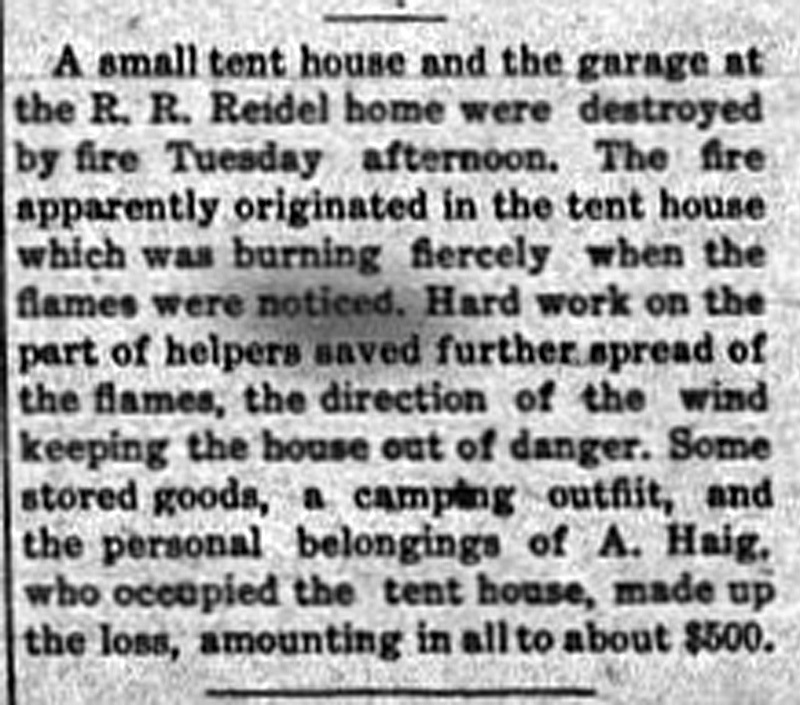 Some stored goods, a camping outfit, and the personal belongings of A. Haig, who occupied the tent house, made up the loss, amounting in all to about $500. Been Watching Newhall Avenue Lately? Count the cars taking the short cut to the Highway below Saugus. I believe that Newhall Ave. frontage is the best speculative buy in Newhall today. Prices are still low. You can get a lot 40x130, with gas, water and electricity NOW in, close to the Lyons Ave. intersection for $470.00 one-fourth down, balance monthly payments. Also offering big residence lots from one-sixth to one-half acre, priced from $650 to $750. Acreage: — Six to two hundred acre blocks. Rental: Modern 2-bedroom. Every convenience, unfurnisht. $30 monthly. 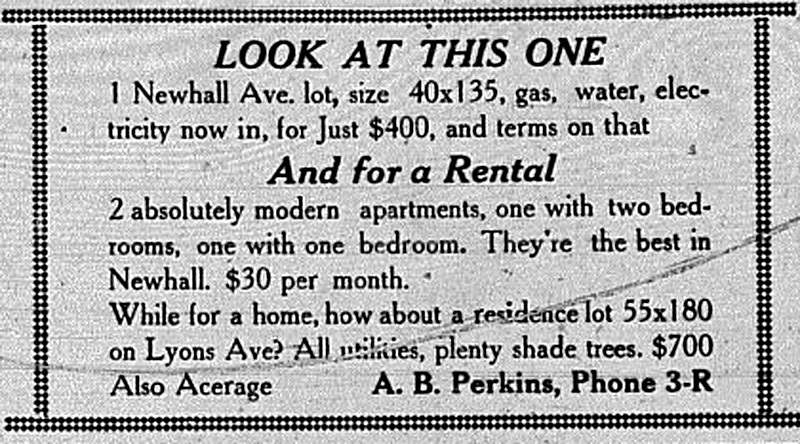 The Newhall Signal | Thursday, August 5, 1926. The A.B. Perkins family have moved into their new home on the old school property. 2 absolutely modern apartments, one with two bedrooms, one with one bedroom. They're the best in Newhall. $30 per month. A.B. Perkins, Phone 3-R News story courtesy of Tricia Lemon Putnam.